Sometimes I start talking and I can’t stop. I get going on a tangent, complain and harp and let loose the ideas that have been rolling around in my head, the comments that I keep bottled up for fear of appearing rude, mean, or worse: uneducated. Usually I have an audience of one – my husband. He’s a good audience. He knows when I’m just blowing off steam and when I need to be reined in with a comment or two of his own. He listens to my oratories without much interruption – not that there’s much of a chance for that, but still. His listening is a show of grace – he could walk away while I blather, but he doesn’t. He settles in, no matter how painful. In the meantime, I learn from his example. I appreciate his show of grace so much. Things in the world are scary right now. We see attacks within our towns and cities, sometimes between cops and kids, sometimes between handfuls of gunmen and crowds of people. Humans fight every day. We see what happens on a global scale when there is a lack of grace. “I can’t even with my Facebook feed right now – so much hatred” – say those who choose to rely on social media for connection, news, and information. We all have opinions, and those with the most radical, divisive ones have the loudest voices. The rest of us are offended, scared of what people are capable of, surprised to discover certain things about the people we thought we knew. We cut them out of our social media lives with the swiftness of death’s arrival. We receive less and less grace from our fellow humans every day, and we cocoon ourselves tighter and tighter with those who share our beliefs, creating more division. We respond to a lack of grace with our own, and say we are protecting our minds and hearts. “You can’t change what anyone else believes by posting articles and links on social media,” says my husband. “People aren’t there to change their minds.” We read what we want to read. Websites offer self-satisfying clicks to obtain the information we want, to get support for our own opinions. Gone are the days of subtly being influenced by both sides of a story in the newspaper; we can push a button to hear exactly what we want to hear, and click away when we don’t. We find ourselves more apt to point fingers and warn and cut out, less apt to help along and love. We forget that we all want life, love, and health – all wonderful things that many of us take for granted – and focus on the things that separate us. Each of us thinks that our own opinion is the right one, and X out the ones that disagree. Dissent occurs. We are missing one ingredient when this happens: grace. When we cut people out because of their differing opinions, we withhold grace. When we hear what they have to say and respond with respect, we offer it. Just as God sent his son to earth to offer us the gift of salvation despite any good we have done, we can respond with grace to those friends and loved ones who offer thoughts and opinions that are drastically different than our own. We can each do this, no matter which side we’re on. It’s work, and it’s individually-based, but it can be done. We might not have the loudest voice in shouting our grace, but it might have a huge impact in our interpersonal relationships. 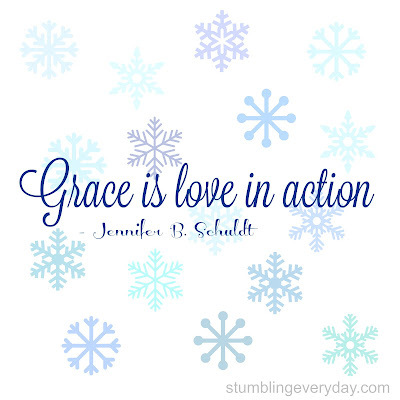 Grace can beget grace – those of us who believe in Christ’s gift live it every day. Why not start practicing it today? Even before he made the world, God loved us and chose us in Christ to be holy and without fault in his eyes. God decided in advance to adopt us into his own family by bringing us to himself through Jesus Christ. This is what he wanted to do, and it gave him great pleasure. So we praise God for the glorious grace he has poured out on us who belong to his dear Son. He is so rich in kindness and grace that he purchased our freedom with the blood of his Son and forgave our sins. He has showered his kindness on us, along with all wisdom and understanding. Amen! 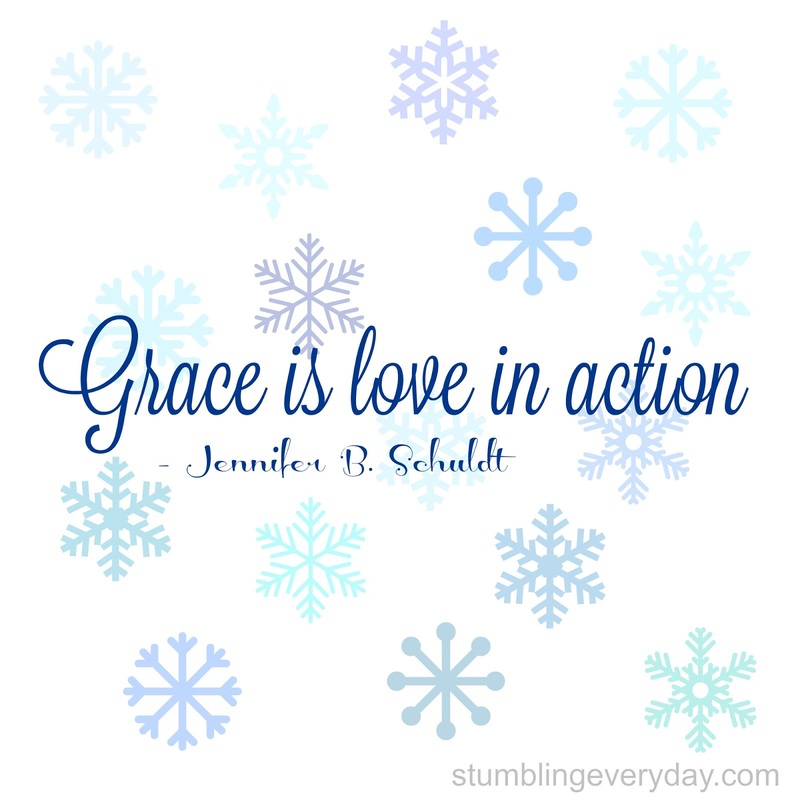 It is all about grace. Only grace - not judgement - can reach across the divide. Thanks so much for reminding us of the gift of God's grace! Not judgment - grace! God's grace is greater than all our sin. Yes our world has changed, but we have to keep being the light. When you talked about audience of one, I always take that to be Jesus so maybe you can say you have an audience of two. "When we cut people out because of their differing opinions, we withhold grace." This is such a great message in a particularly volatile time of opinions being expressed at every turn. Thank you!